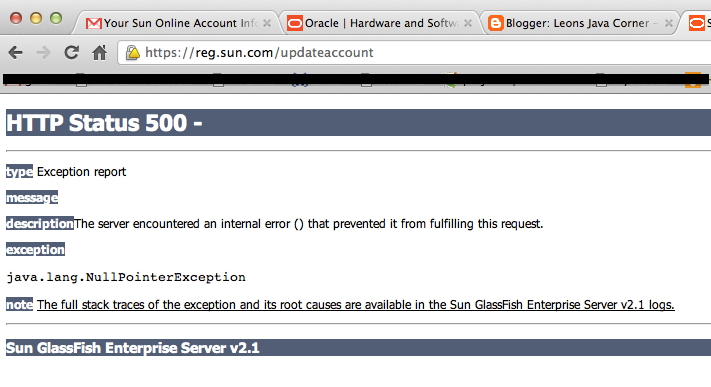 Recently I had to retrieve my sun developer framework account, I wasn't using for 5 years now. I was hoping I can vote on this ugly bug http://bugs.sun.com/bugdatabase/view_bug.do?bug_id=7180557 with localhost and java7 on my mac, I was writing about in previous post. Well - no. However, the process itself was funny enough, since they require you to specify both, username and email, and in my case (and I suppose many other cases) its the same, but its not that easy to figure out. This is going to be another one of those How things that can't happen actually happen post. Where 192.168.1.113 being the ip adress of the machine the service runs on. This adress is used by the client, once the later wants to connect to the service. Ok, this is certainly not the best idea to return "unknown" here (one of those, can't happen anyway bug), but why the heck did InetAddress.getLocalHost() fail? 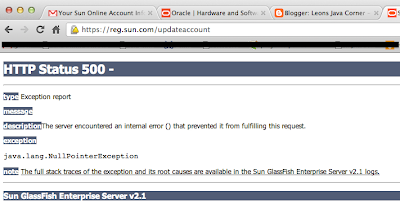 After some googling I found a bug in oracle bug database and a similar issue in openjdk. Seems Java and Mac is getting less and less a love story.